We only get about 2 inches of precipitation a year here in Henderson, NV, so when it rains I like to capture as much water as I can. I use it to water the potted flowers. 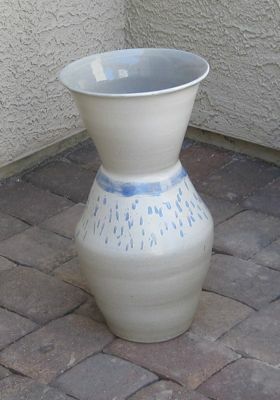 I made this "rain catcher" pot and I set it to catch the run-off from the roof. The rain catcher is 19 inches tall and 9.5 inches in diameter at the top. It works well. We just had our first rain in a couple of months. It lasted about 5 minutes and didn't fully wet the street. Fifteen minutes after the shower the streets were dry again but the rain catcher was nearly full. Your rain water catcher is beautiful. You can use it in planting flowers.